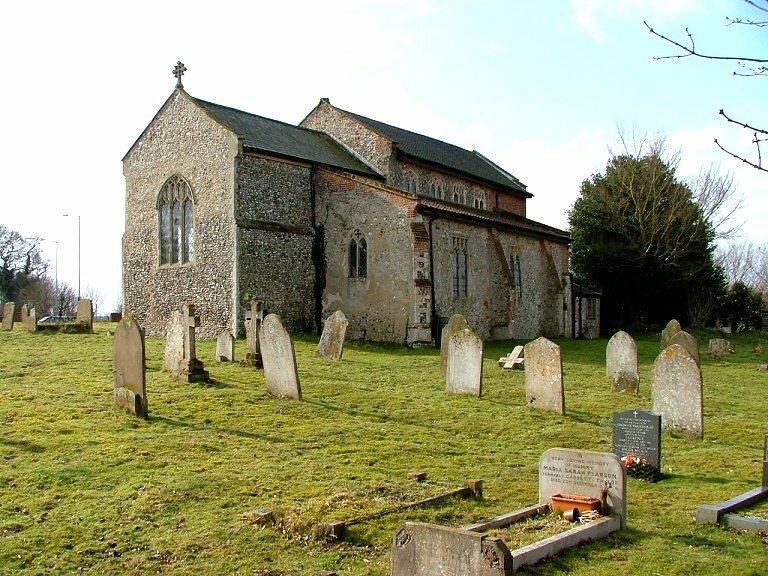 There's something poignant about this poor little church without a tower set beside the busy A47. What should be a lonely spot is filled with the sound of traffic hurtling to and from the Midlands. And yet somehow it does feel lonely still, set on a back lane at the edge of the village. Not that Easton is really a village anymore. This is Norwich suburbia, and if you head east from here you won't see fields again for nearly ten miles. The large building across the road is Diocesan House, which must concentrate the minds of the Parish somewhat; a bit like having your boss living opposite your place of work, peering in the window to see what you are up to. 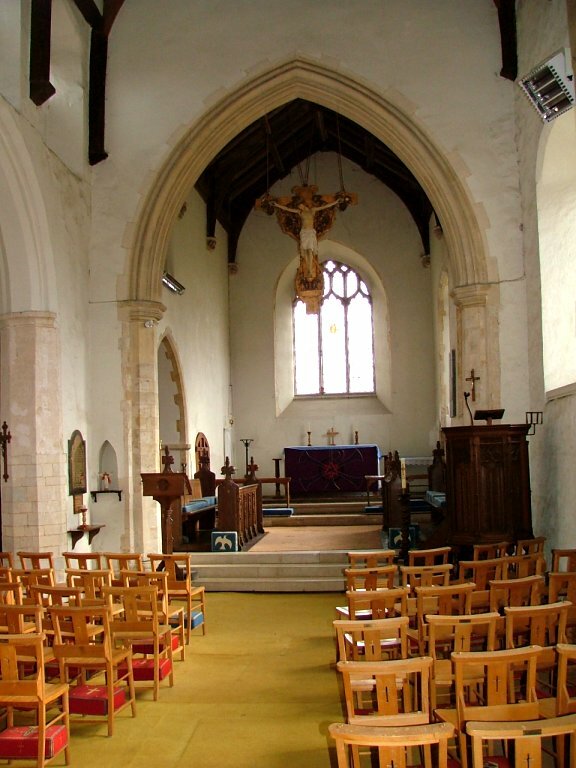 But St Peter is obviously a busy, lively church, with lots going on. 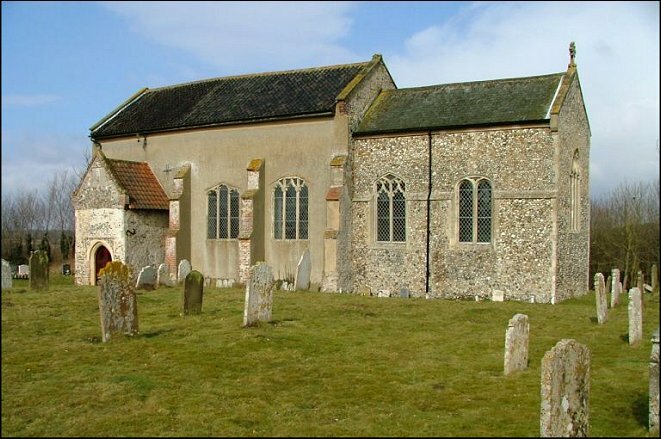 The tower fell in the 18th century, and was replaced by a bellcote on the western gable, which has also now gone. 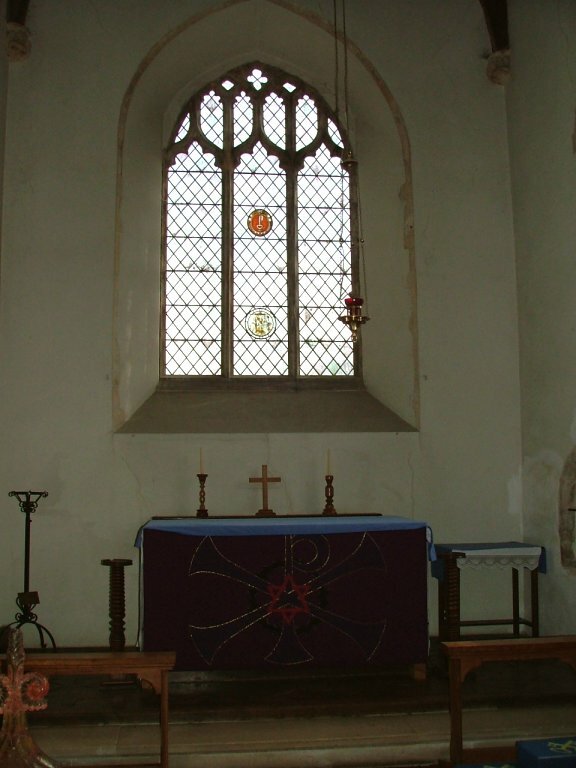 The restoration in the 19th century was by Diocesan architect Richard Phipson, and the chancel is pretty much all his, although he retained the old window tracery on the south side. 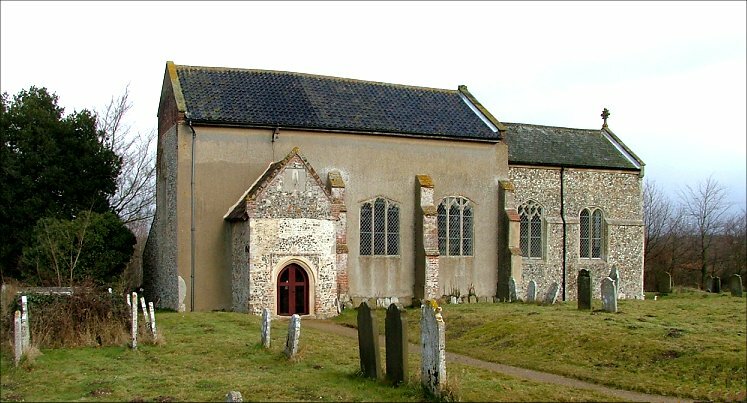 The south porch is pretty, a battered and restored victim of the years, but attractive in its mixture of building materials against the rendered nave. It is very tall, so perhaps there was an upper room once. It conceals a delightful surprise, the doorway. 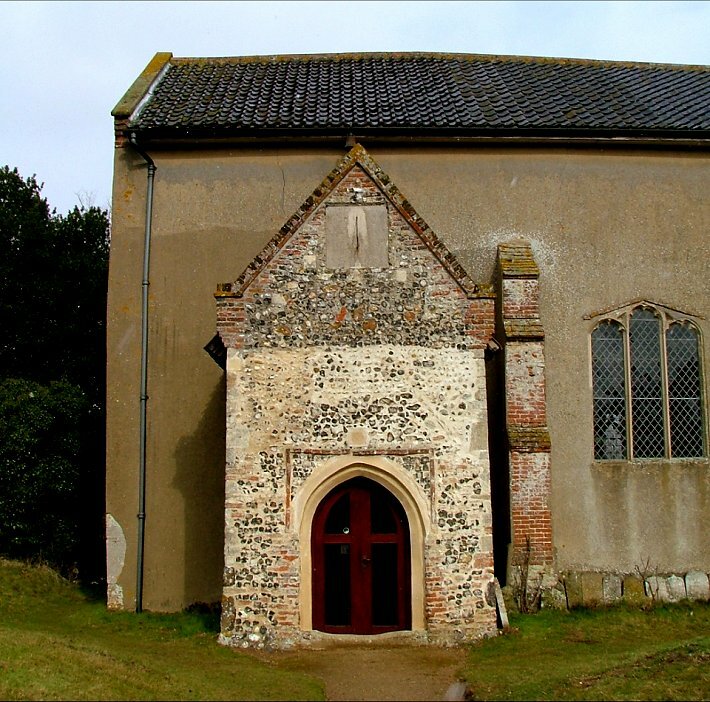 It is about as elaborate as Norman got before handing the baton on to Early English, and is the only survival of the original church on this spot - or, almost the only survival, as we will see. At present, this church is open to outsiders on Saturdays only. Perhaps this is to keep the Diocesan officers out during the week, I mused, as I stepped into a tall, open space, full of light. 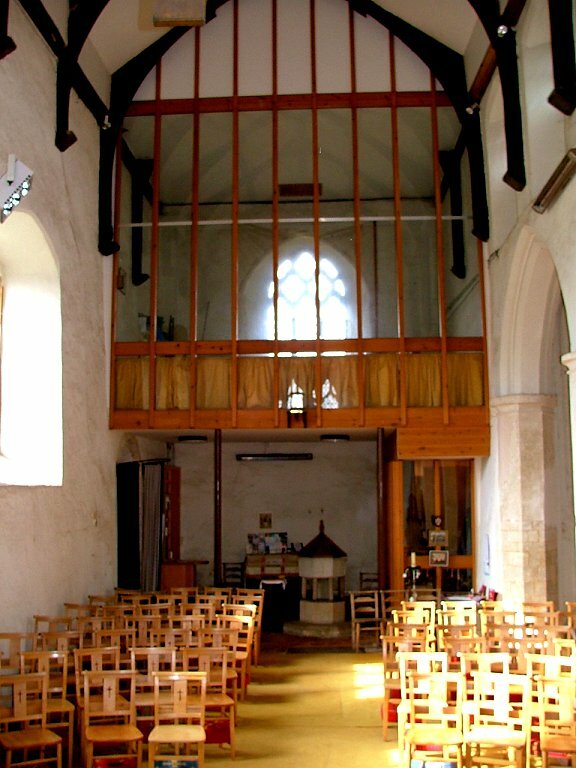 All the old furniture has been removed and replaced with modern chairs, which always looks good, and the balcony enclosed by a tall glass and pine screen, which reaches up to the rafters. I couldn't help being reminded of the final scene of the film The Graduate. 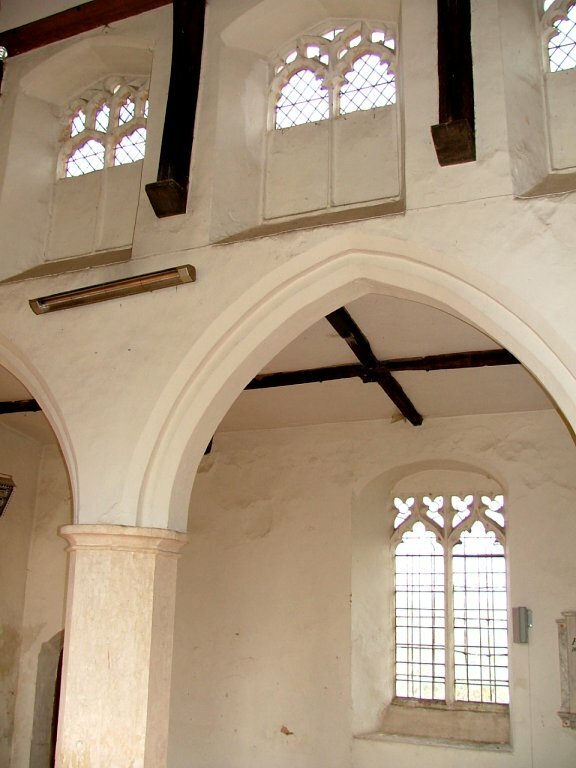 The north aisle is fairly big, a fine clerestory above it. A huge, modern crucifix, originally at St Gregory in the centre of Norwich, hangs in the high chancel arch, and the arcade is also high. 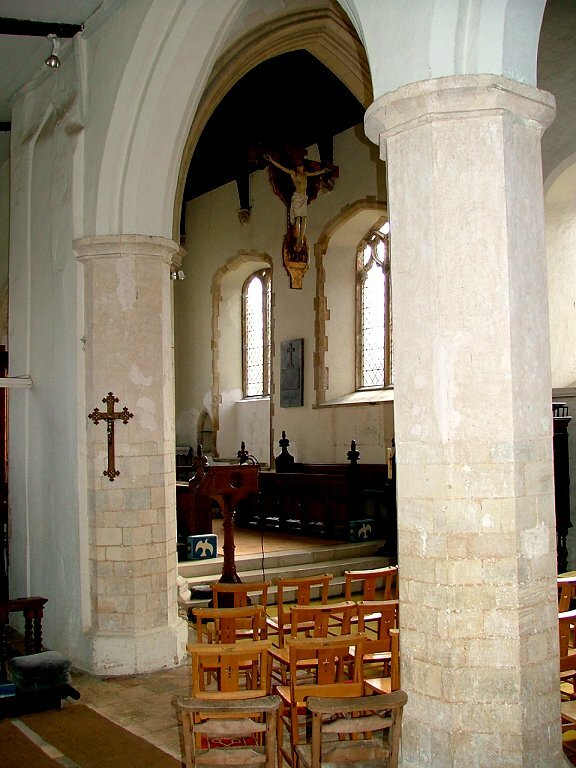 In fact, everything seems higher than usual; even the windows of the nave have sills a good two metres from the ground. If I had climbed down steps into an underground church then it might have looked like this. 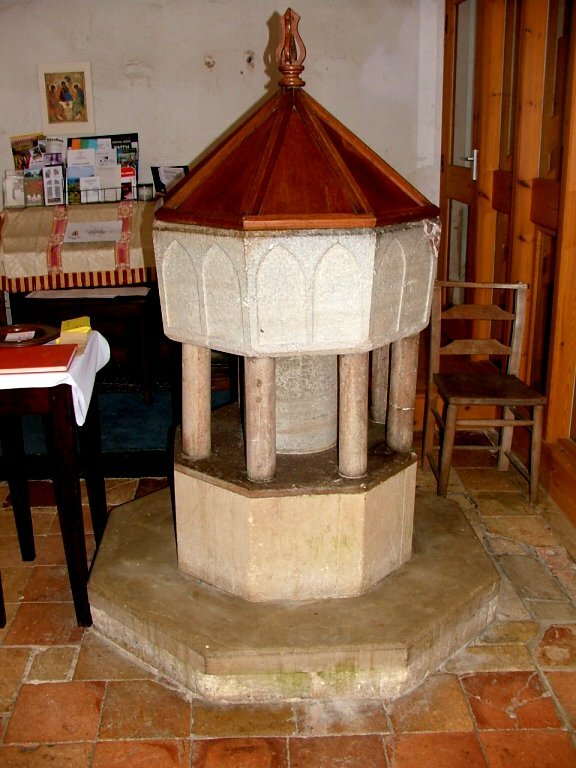 As at several local churches, there is a 13th century Purbeck marble font set on a Victorian collonade. 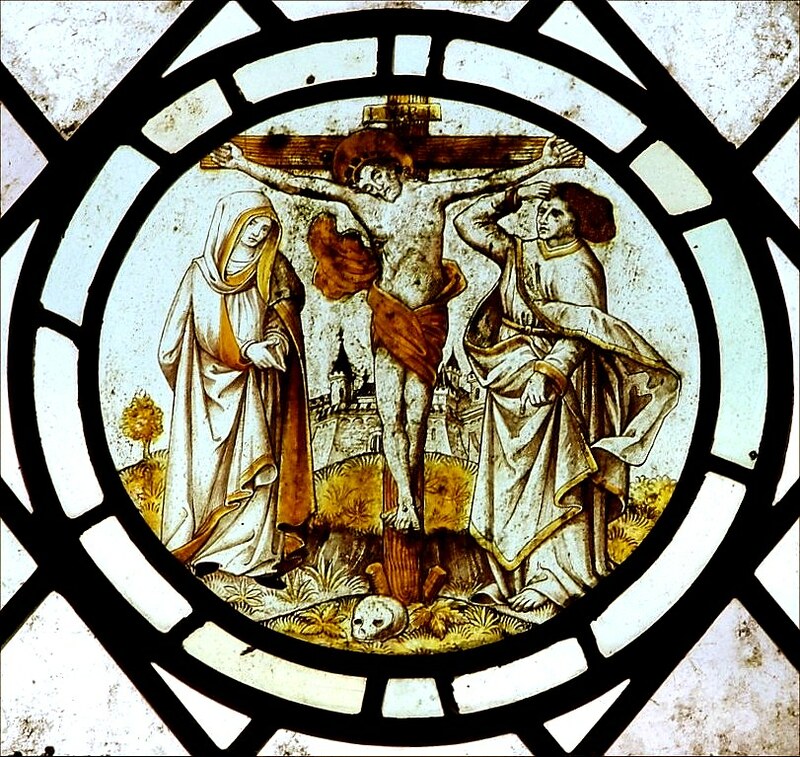 The other major medieval survival is a roundel of continental glass, set in the east window at the other end of the church. 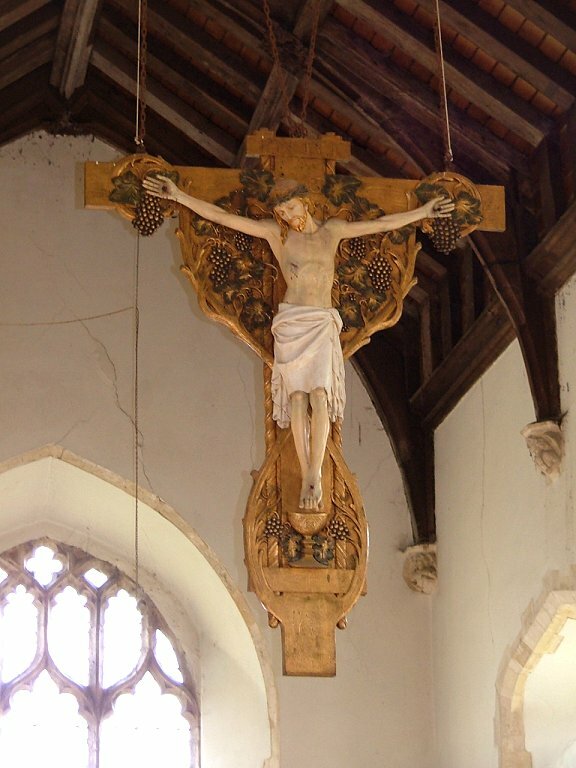 It depicts the Crucifixion. 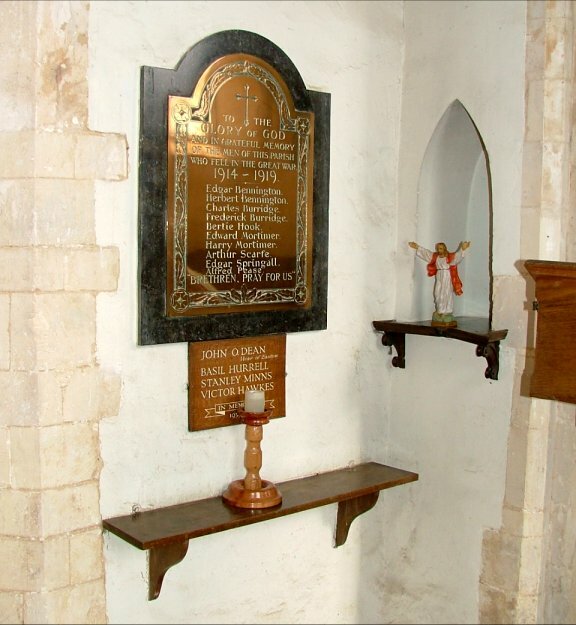 St Peter has two curiosities, neither of which are easily explained. 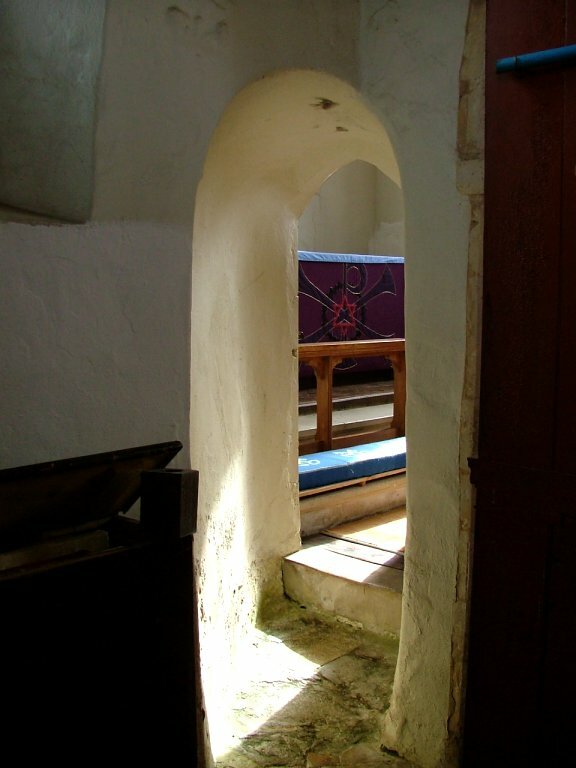 The first is the doorway, a passageway really, from the east end of the north aisle into the chancel. 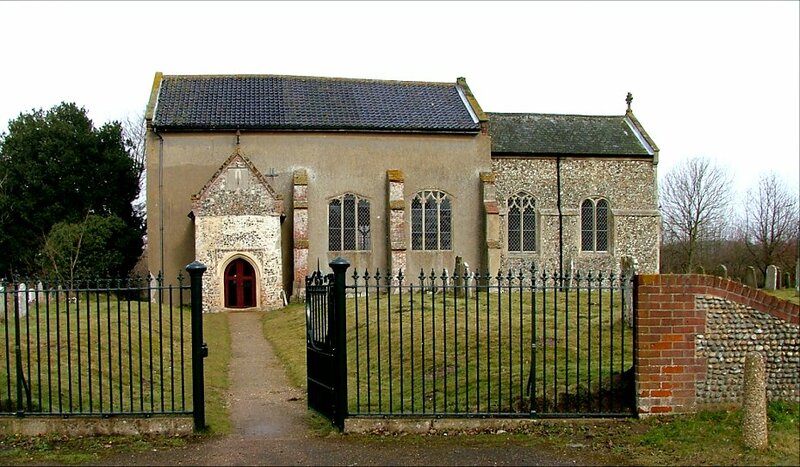 There is something similar at nearby Marlingford, but at both churches the chancel is a Victorian rebuilding. Was it something retained, or a local 19th century fancy? 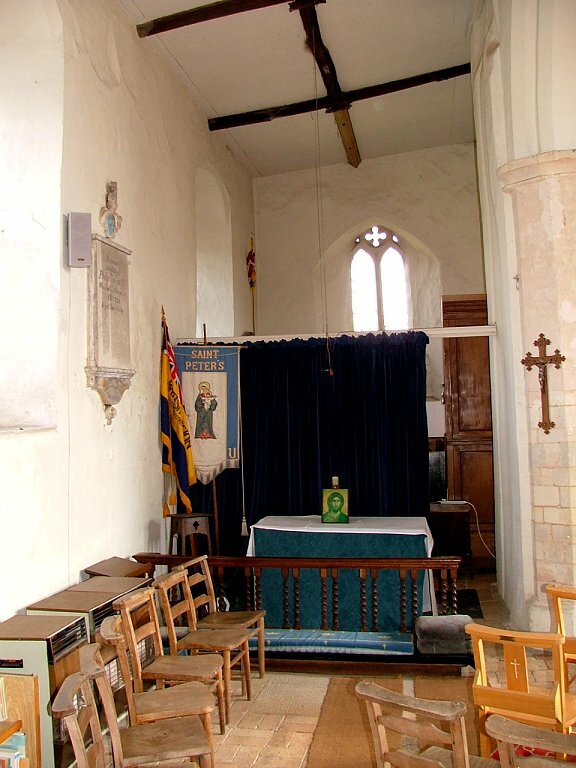 The other oddity is the room at the west end of the aisle, now modernised and fitted out with a lavatory and kitchen. I had seen something similar at Salhouse the previous year. The suggestion there is that it is the base of a former tower, and the same may be true here as well. 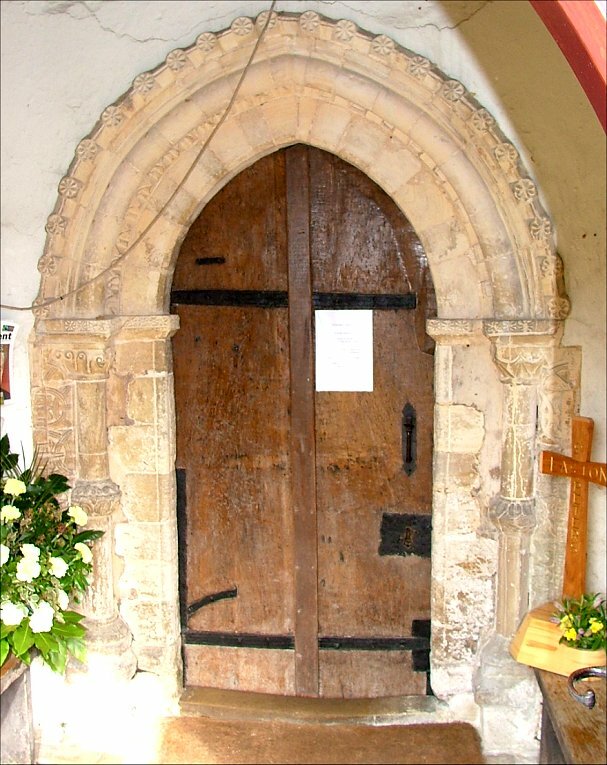 Perhaps the builders of the nave in the 14th century moved the doorway from its former position to the current site. I stepped outside to find that it was snowing. I walked around to the north side, admiring the elaborate flushwork; this must have been a very grand church once. The sound from the traffic got louder, and St Peter seemed rather beleagured, the 21st century rushing past it, making such a noise. As I stood looking, I realised that there was a recent child's grave right beside me, covered in flowers and teddies. How sad. The misplaced apostrophe in the inscription made it all the more poignant.